Image caption Bhiodh an sgeama trì tursan na bu mhotha na tuath-gaoithe an Rubha is Shanndabhaig aig Beinn Ghrèideig - an tuath-gaoithe coimhearsnachd as motha a th' anns an Rìoghachd Aonaichte an-dràsta. Chaidh fios a chur gu Comhairle nan Eilean Siar gun tèid cead dealbhachaidh iarraidh airson ochd crainn-ghaoithe a stèidheachadh air talamh ionaltraidh Mhealaboist is Bhràigh na h-Aoidhe ann an Leòdhas. 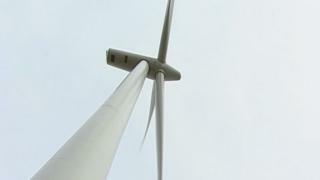 Tha cead mu thràth aig Lewis Wind Power (LWP) airson pàirt den tuath-ghaoithe mhòr acasan a thogail air an aon phàirt den mhòintich eadar rathad a' Phentland agus Beinn a' Bhuna. Ma thèid an tuath-gaoithe ùr air adhart, cha bhi sgeama coimhearsnachd am Breatainn cho mòr ris. Le ochd crainn le 3.6 megawatt anns gach fear, bhiodh a' phròiseict trì tursan nas motha na an tè aig Beinn Ghrìdeig aig muinntir an Rubha agus Shanndabhaig. Sin an tuath-gaoithe coimhearsnachd as motha anns an Rìoghachd Aonaichte an-dràsta. Tha cead aig LWP airson tuath-gaoithe le 36 crainn air talamh ionaltraidh Mhealaboist is Bhràigh na h-Aoidhe agus grunn bhailtean eile, agus tha beachd ann gum faodadh strì a bhith ann a-nis airson cead dealbhachaidh airson na h-aon làraich. Feumaidh an cead a th' aig LWP agus an t-aonta a th' aca le Urras Steòrnabhaigh, leis a bheil an talamh, a dhol gu Cùirt an Fhearainn airson cead deireannach fhaighinn. Tha ceist ann cuideachd mu dè thachradh dhan chàball dealain a cheangladh na h-eileanan ri Tìr-Mòr mura deadh sgeama LWP air adhart.